This good ol’ Coach Taylor nugget kept me going in the Hamilton Marathon on Sunday (“But you gotta try. That’s what character is. It’s in the trying.”), and it’s not the first time it’s come to mind during a race. I’d considered adding this race to my schedule before I went to run the Chicago Marathon. While I’m by no means disappointed with how Chicago went, I wasn’t thrilled with my time and would love a marathon PB. But I only confirmed I’d be running Hamilton a week and a half before the race. So I didn’t train as much or as intensely as I would’ve had I planned on it all along. 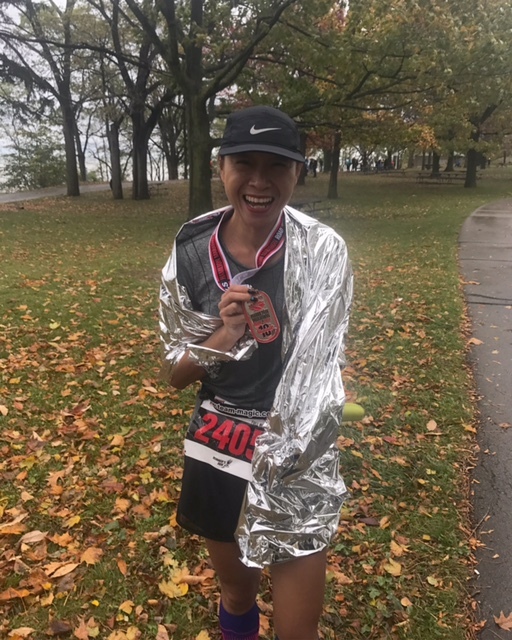 I took the entire week off after Chicago (which I’d likely have done anyhow); week two, I ran two short slow runs in anticipation of helping to pace at the Scotiabank Toronto Waterfront Marathon, in which I paced 12k. Week 3 I was really busy with work so I did a 10k run and a 16k. And the week before the race, I ran a 5k tempo on the treadmill, and attended a Spin class on the Friday night. I knew the Spinning wasn’t ideal but I needed to burn off some stress and I took it easy in class. I think the limited number of runs and then that Spin class is what made Hamilton Marathon pan out as it did for me. On the day before the race, I was doing errands and could tell my legs were sore from the Spin class. On Sunday, I was pretty nervous about the forecast. It showed 90 percent light rain and through my race the temp was to feel like about 11C I think. I stepped outside and it felt warmer than I realized and it was basically very light drizzle and I felt very relieved about the rain. So I opted to wear shorts rather than capris and left my water-resistant rain jacket in the car. The race starts at ArcelorMittal Dofasco Park and there’s an arena where you can stay warm and use the washrooms, so that’s always a nice bonus to a race. I arrived at 7 a.m. and sat inside, just trying to not get too anxious about the race, and then I quickly realized there was five minutes to go til the race started. I started looking at everyone’s bibs and saw it was mostly half-marathoners and it dawned on me that they didn’t start at the same time. Right then there was an announcement over the loudspeaker for all marathoners to head to the start and so I dashed outside. It was pouring rain. I wanted to cry. I already felt miserable and the race hadn’t started yet. Then It was a bit of a scrum at the start since there wasn’t a fence for a very defined starting chute. It rained pretty consistently for the first 12k or so, and so I kept on the garbage bag I’d put on but ditched it when it cleared briefly even though I knew it’d rain again. I just had to accept I’d be soaked. Then you reach the Red Hill Expressway. Which you hear all about being fantastic because it’s downhill. So I was expecting several kilometers of downhill. Nope. Just the ramp to get onto the Parkway is a noticeable downhill (although I know other runners who find the whole expressway downhill; to me it felt flat with the slightest decline in some areas).I did gain some speed here on the downhill ramp and my Google Play Music playlist seemed to know just the right song for the moment: move, get out the way, by Ludacris. The last section is in Confederation Park. This is the best part of the route as the views of the lake and of some homes along Beach Blvd. are lovely heritage homes and there are some people here cheering. So, as I mentioned my legs already felt tired from Spin. And as I got going, I think by 6k my legs were already feeling sore and tight. So I knew it was going to be one long and ugly race. I started debating at about 10k if I should quit and just DNF and call my friend to pick me up. I had this debate until about 30. At the 30k point, being closer to the finish, a DNF didn’t seem like a smart choice and with my legs begging to not be running my thoughts instead focused on whether walking the remainder of the race was a good idea. I figured I wouldn’t finish last even if I walked the last 10-12k. I took walk breaks and the main reason I would start running again is because I couldn’t bear the thought of how much longer I’d be in the rain and wind if I walked the rest of the race. Because that wind and rain was no joke. On the country roads there was a strong headwind; I’ve read the wind was 48km/hr. Gah! Running in wet gear and soaked shoes is not pleasant. I did a whole lot of rationalizing during this race, especially toward the end. “There’s 12k left, so that’s basically like two 5k runs, oh and a little extra! 5k is nothing!” “Six k to go. 3k you can do in your sleep, so just two of those, easy peasy for you!” When I saw an exit with my friend’s street name on it, I thought, “I’ll just follow it and that’ll take me ‘home’!” But then I realized that was probably just as far or further than actually finishing the race. And so, I kept going. I was on pace to BQ about half of the race. But I knew I wasn’t going to be able to maintain that pace, my legs were heavy. So I switched to aiming to PB since that was within reach, but it wasn’t in reach for long. My legs just couldn’t go any faster and I watched my time grow longer and longer, and. soon doing better than my Chicago time from four weeks ago wasn’t even within reach anymore as I basically threw in the towel and took walk breaks to relieve some of the misery I felt. There is little cheer support along the route, although a few small groups of friendly faces with encouragement in Confederation Park. It gave me a boost to have some of my sister’s running group recognize me and cheer. And then to hear my name on the speaker when I ran by the Mizuno tent. And although I was too weary to form a proper thought or even properly recognize people, it was great to see a few other runners I know cheering. Thank you for braving this awful weather to cheer, everyone! There’s little entertainment along the route, too. I recall two drum bands, which were great, but that was it. Another interesting thing about this race? There are several intersections where there is no police officer directing traffic and the drivers regulate themselves to make their turn or drive through. People in Hamilton seem much more patient and tolerant of this than Toronto folks; in races in Toronto, I know I’ve run by many irate drivers enraged about the delay on their drive to their destination. Drained and feeling defeated, I finally crossed the finish line with a chip time of 4:10:20. Which makes it my second slowest marathon of the eleven I’ve run. 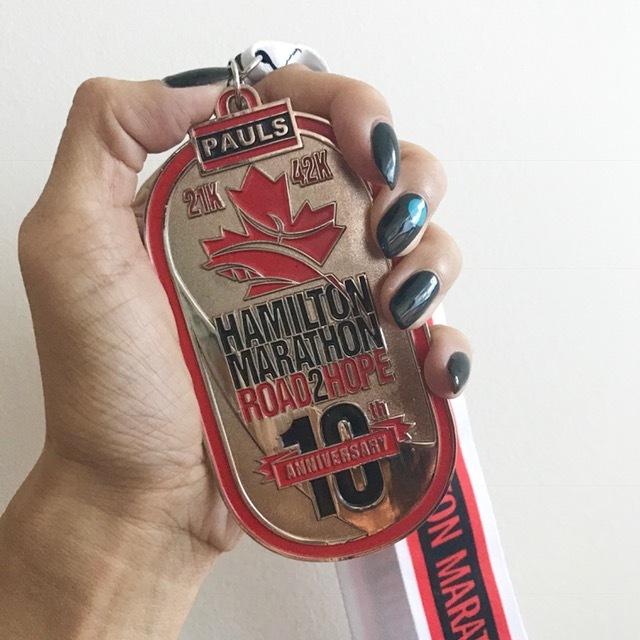 I believe my slowest was my second marathon, the Scotiabank Waterfront Toronto Marathon in 2012 when the weather was very warm. It was a very tough go. But it’s in trying, right, and I am proud to have run eleven marathons. It truly still boggles my mind that I’ve become a runner at all so despite feeling disappointed, I am ultimately proud of this achievement. The last time I ran two marathons a month apart, I managed to PB in the latter one, but I’d trained consistently in the four week span. I won’t do two marathons a month apart again if I haven’t maintained training. Please stop me if I forget this fact! 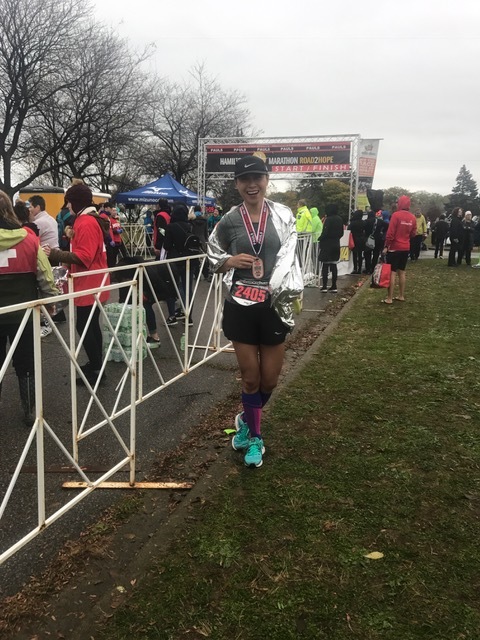 Oh, and I have very few photos from the race to include in this post because I just felt so consumed by misery to take photos, and also because of the rain. Raindrops on the iPhone screen make it hard to use the touchscreen; plus I was afraid to fiddle with my phone in case i accidentally paused or messed up my NRC app that was tracking my run. Thank you to Ben at iRun for his race bib, all of the volunteers at the race, the spectators (your signs and cheers and cowbells lifted my mood on a cruddy day), and to my friend Yuki, who was my race support team (she picked up my bib, let me stay at her house, cooked me this yummy dinner of carbs, and sherpa-ed me to and from the race!). As for what’s next? That’s it for marathons for 2017 for me. I won’t rule out a half or a shorter distance race. I’m thinking another full in the spring is likely, but for now I’m going to enjoy some downtime and put the hours and energy that marathon training called for and pour it into other interests, like dance class and cooking. Running. Travel. Food. Those are definitely big passions of mine. So I was especially thrilled to partner this season with Reebok Canada on an article that you’ll find at Elle Canada focused on tips and tricks for running while you travel—two of my top reasons for living (did I mention I also enjoy exaggeration?). 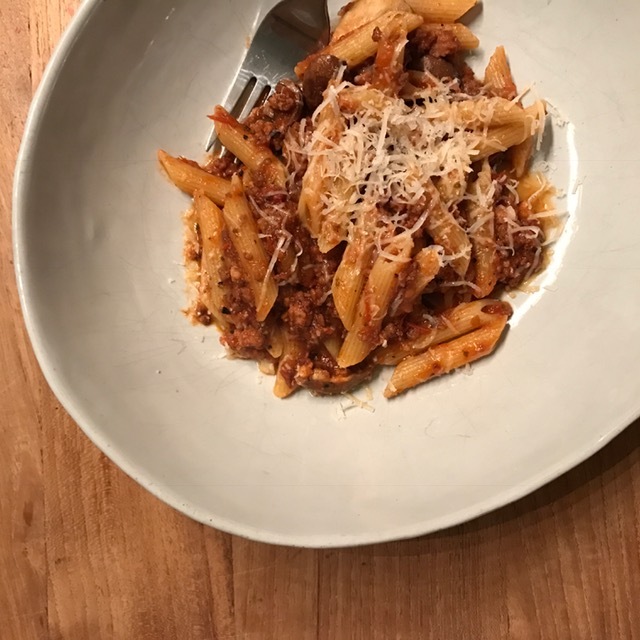 (And as for food, well, when it comes to running and especially the travel/running combo, food is naturally part of the picture, too—one must fuel and reward, after all!). I’ve been running in the Reebok Floatride for a few weeks, and I virtually forget what’s on my feet because they’re so lightweight. Dubbed “cushion without compromise,” the Floatride makes my runs feel effortless thanks to the cushioning and responsiveness of the sole, and a knit upper that’s very breathable and gently hugs each foot as I train. Check out my article at Elle Canada for travel and running tips (think packing and find-a-route ideas) and see you out running, ‘k? Whether that’s here in Toronto, or somewhere around the world because, yes, I am more often than not in training for a race. And in the meantime, you can discover more (or tag your own Floatride runs) on social media with the hashtag #feelthefloatride.